Prayer is the foundation of change and we believe that it is an essential basis to everything that Hope4Africa does. We spend time praying together as a team and we also spend many hours on prayer walks through the community. Often during our walks we encounter people who are thirsty for prayer and we are able to pray specifically for their needs. While English is one of the 11 official languages in South Africa, for many people reading, writing or speaking in English is a challenge. In addition, English is the main language used in business, education and health care, so lacking skills in English disempowers people on many levels. Some of our friends in the inner city asked us to teach them English, so we have been offering classes for adults since 2015. Because our classes are small, students learn quickly, and also form strong friendships on the journey. As a result, in addition to giving people valuable communication skills, community is strengthened as people from different races understand and care for one another. We have seen a number of our students go on to access formal employment because of their ability to communicate. Discovery Bible Studies are one of the ways that we equip people in communities to begin to unlock God’s word and experience its power for themselves. 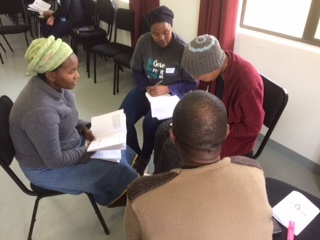 The ministry team will spend several weeks facilitating a group with people who are seeking to discover more about God, with the aim of empowering them to lead their own groups with people in their communities. Groups often begin with what the Bible describes as a “person of peace” (Luke 10:5) who has influence in their community and who has a hunger for the Word. The idea is that Discovery Bible Studies happen in self-formed communities and are a shared discovery process rather than a formal teaching of God’s word. People in the groups get to know God and one another as they read and live the scriptures in community. As these groups develop a firm foundation with individuals committing to follow Jesus, they begin to function as simple churches. Clusters of simple churches from any area will meet regularly for celebration, teaching and fellowship. With many communities experiencing poverty, high unemployment rates, and other injustices, Hope4Africa is committed to facilitating healthy community development projects alongside discipleship ministry. With Jesus as our role model, we believe in caring for people holistically, ministering to the body, soul and spirit. We never enter a community telling them what their problems are and how we can help. We rather build relationships, treat people with dignity, and empower them to facilitate for the change they deem necessary in their community. Examples of the practical outworking of this could include providing English classes that will empower people to communicate more effectively and thereby be treated with greater dignity; assisting families to grow vegetables for personal use or to generate a small income; offering small business seminars to assist entrepreneurs to flourish. The vision of Cherish & Courage is to inspire and equip young women and men to live pure lives. The heart of both programmes is a story called “A Life Worth Living”. 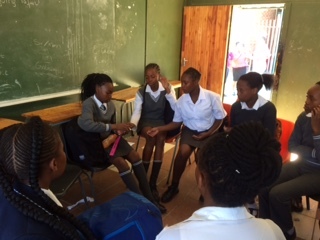 As the single gender groups work through this story, they learn about God’s heart for relationships, the power of forgiveness, HIV, and how to actually live a pure life. 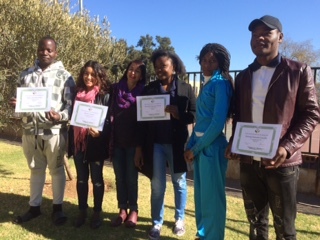 By the end of the programme (8-10 weeks), participants usually report that they have grown in many areas, including relationship with God, feeling empowered in relationships, and confidence as a leader. Cherish in Joburg is part of a larger movement of Cherish & Courage centres around the world, in countries including South Africa, Swaziland, Malawi, Zambia, Kenya, Mozambique, Costa Rica and Brazil.